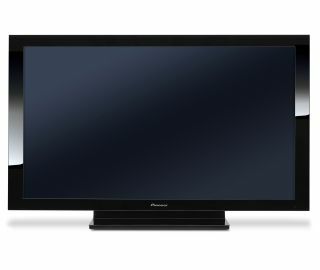 Pioneer stunned CES 2008 with the revelation that its new super-black prototype TV is the first plasma panel to produce true blacks. People are also very impressed with the company's new ultra-thin display which packs all the technical prowess of the 8G Kuro into a thickness of just 9mm. But are these really massive technical advances, or is this just the logical next step for the manufacturer of the best TVs in the world? "What you're seeing down there is a conceptual model, says Pioneer product manager Jim Catcheside, pointing at the 9mm prototype. "It's just a display panel, it's not a TV. I think we have to bear that in mind... We're openly asking how thin does it need to be? "Because 9mm is very impressive, loads of people are crowding around it, but what are you going to do about things like speakers? TV tuners? So we're either back to component television again - separate media receivers, separate tuner boxes, maybe even speakers in different solutions, and then the panel that is just a painting on the wall." "There is definitely a demand for [a 9mm flat panel], but you have to rule it out as an integrated television." "One of the breakthrough things for us when we developed the PDP-5000 [Pioneer's first 1080p plasma panel] was a new crystal emissive layer. It enabled us to control the discharge, speed and timing in which each cell can go from black to white. We can control it much more efficiently, which makes the panel much more efficient," Catcheside says. "That enables us to get high intensity, brightness and good yield out of a much smaller pixel, hence we had the first 1080p panel... Now we have the 8G Kuro as well as that's also really to do with crystal emissive layer. "What we're seeing now with super-black and indeed 9G, is that it's 80 per cent blacker than 8G [Kuro], and 8G [Kuro] was 80 per cent blacker than 7G. So it's a staggering improvement in black levels. "That's to do with crystal emissive layer being the heart and the core to it... and it's also about the electron plate within the rear substrate of glass that actually ignites the gas. [Pioneer's engineers have] moved the position of that back panel - the first time that's been done since the 1990s when [Pioneer] introduced the first panel. That again is fundamental to this. "Finally with the pure black we're talking about a cell that has no priming discharge response, so when it's not being asked to do anything it is off. It's just black. That is the key to the Holy Grail of black. "Plasma technology is self-emitting. But the problem has always been: what each cell does when it idles, and when you go between white and black. You get a discharge response and that is what causes blacks to appear dark grey. You get this continuous glowing luminance from the cell. "And now what the Japanese engineers have developed is obviously a way of completely discharging that luminance immediately, so it's instant. Cells can go from bright white to deep black in an instant, and even in our 8G Kuro plasmas that is not possible. "That's why [Pioneer] is saying forget contrast ratios. [TV makers] all measure them differently - that one quotes 30,000:1, that one quotes 50,000:1, that one quotes 100,000:1. We're not going to quote anything any more. It's pure black. It's immeasurable. There's not a measurement tool on the planet that can measure it. It's just black. It's off." "The panels obviously aren't the cheapest, we don't want to be the cheapest. We don't want to produce the most. We just want to make the best. And i think what you've seen on the Pioneer stand today proves that. It's fantastic."